No planet is better studied than the one we actually live on. 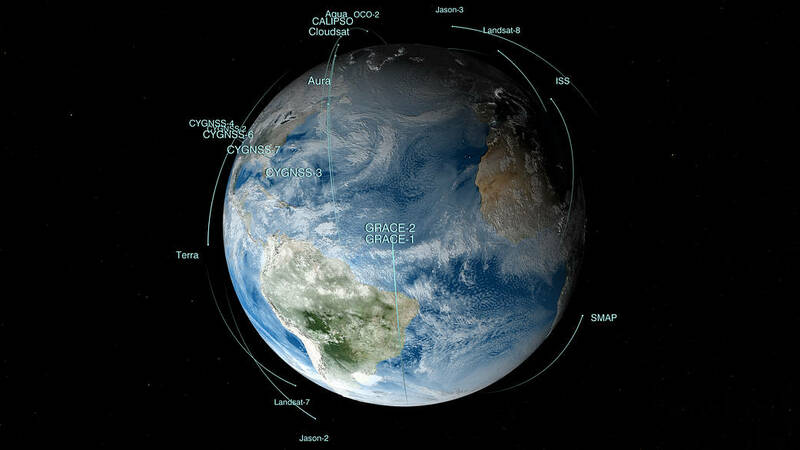 NASA’s fleet of 18 Earth science missions in space, supported by aircraft, ships and ground observations, measure aspects of the environment that touch the lives of every person around the world. They study everything from the air we breathe, to rain and snow that provide water for agriculture and communities, to natural disasters such as droughts and floods, to the oceans, which cover 70 percent of Earth’s surface and provide food for many people around the world. Satellites and instruments on the International Space Station circle the whole globe, seeing both where people live and those remote parts of deserts, mountains and the vast oceans that are difficult if not impossible to visit. With instruments in space, scientists can get data for the whole globe in detail that they can’t get anywhere else. This visualization shows the NASA fleet in 2017, from low Earth orbit all the way out to the DSCOVR satellite taking in the million-mile view.